As we enjoy the week of New Year holiday, ArmeniaNow presents in this issue articles that were produced by our staff for AGBU magazine. Copies of the magazine are available from our newsroom: 26 Parpetsi, No. 9. 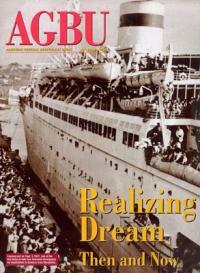 Visit online at www.agbu.org. *Odar: Western Armenian language, meaning someone who is not Armenian. Standing in a queue at a border crossing several years past, my time comes to hand over documents. The agent looks at the documents; looks at me. “So you are a U.S. citizen, but a resident of Armenia,” the agent says. Nearly a century after surviving its greatest threat to identity and indeed to its very existence, the world-wide nation of contemporary Armenia is challenged by assimilation. More Armenians live outside the republic than inside it, creating a sort of virtual community that is linked by blood, language and history but only partly by the commonality of a single society. Genocide diminished and dispersed the population. Borders drawn in its aftermath shrunk the country. But the nation of Armenia would survive, so that now at least a few have realized the chance for repatriation. In 1972, a combination of political ideology and curiosity brought Yervand Minasian to Soviet Armenia from Iraq. The young man bursting with communist naiveté was disappointed in Armenia. He had long heard his father praise Armenia, from which the family originated. Arriving, though, Minasian was refused citizenship, and was further disappointed to learn that his only chance to get a communist membership card was through bribery. Over the past half decade or so, no Diaspora presence in Armenia has so noticeably increased more than those from Iran. When Armenia hosted Iran for a soccer match this August, one commentator said it appeared as if the game were held in Tehran, given the large turnout of Iranians on hand at Vazgen Sarkisian Republic Stadium in Yerevan. Ralph Yirikian has been the most effective and influential corporate leader in independent Armenia. Unfortunately for Armenia, there has not been much competition for such honors. Alex Sardar has an unenviable task of helping build civil society in Armenia. He has, too, an enviable attitude, required for his success and for Armenia’s hoped-for better future. Living in Armenia for nearly nine years, Sardar has learned to appreciate “the process” of helping create change. Whether or not he sees the end result is no less important than being part of the effort. The bright idea of the Luys (Light) Foundation led 52-year-old Jacqueline Karaaslanian to change her life dramatically, leave her career at Massachusetts Institute of Technology, and start a new phase of her life, in Armenia. For more than 25 years at MIT including as a special projects director (Future of Learning Group), Karaaslanian had worked on developing educational programs worldwide. In 2009, she was invited to apply her talents in Armenia as the Foundation’s director. It is December 1993. Armenia is at war. People are leaving with every chance. Water is rationed and electricity is as inconsistent as full shelves in sparse shops. Arpi Vartanian has just earned a degree in international management and, at 27, the bright Armenian-American from Michigan has promise and prospects waiting. From Washington, D.C. to Yerevan, Richard Giragosian has created a reputation as a studied analyst of the gnarly politics that often bewilder the rest of the world (to the extent that anyone pays attention), in trying to decipher life in Armenia and its neighborhood. Giragosian’s challenge is to make sense of Caucasus-style politics, where rules are made up on a shifting political landscape that frequently appears lost in transition even for scientists. In the 1990s Jirair Avanian’s reputation was near mythical in Yerevan. Whatever business appeared that broke the Soviet mould in the glacial-speed development of Armenia as a free market, was immediately thought to belong to the repatriate with Western ideas. For more than a decade, though, his own name has become an appendage to the landmark restaurant he opened in 1998. The bubbly businessman is more likely, now, to be referred to as “Dolmama Jirair”.